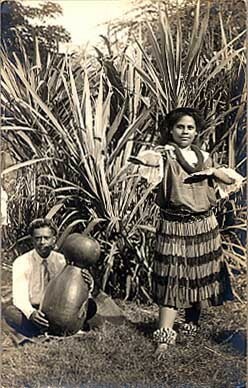 Hawaii Hula Dancer RP #1 - Entertainers - Real Photo - Vintage Postcards | VintagePostcards.com: vintage, old, antique postcards for collectors. Real photo of a native dancer and musician. May be by photographer R. J. Baker as it is his usual quality composition, contrast, etc. Corner crease.